Spice Island Beach Resort has a “child stay free” deal valid through Dec. 15. 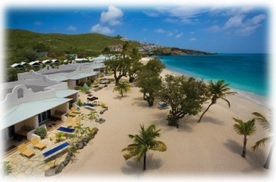 Spice Island Beach Resort (www.SpiceIslandBeachResort.com), the luxury Grenada property just recognized as the #1 rated hotel in the Caribbean according to TripAdvisor reviewers, is offering a “child stay free” offer. One child 5 – 11 years of age can stay free in one of the resort’s charming Oleanander or luxury beachfront Sea Grape Suites (Sea Grape Suites pictured right) – a savings of $230 each per night. This promotion is valid now through Dec. 15, 2013 and can be combined with other offers. Spice Island Beach Resort appeals to discerning affluent travelers with its reputation for service, luxury beachfront and private pool suites, inventive spa treatments incorporating local spices and ingredients, and an unmatched culinary program featuring seven-course dinners which range from diet-friendly to decadent. When parents need some alone time, kids are well taken care of at the Nutmeg Pod, a supervised children’s program with complimentary enrollment for children ages three – 12 (children must be toilet-trained). A weekly schedule of organized activities is available to keep children entertained daily from 9 am – 5 pm, and includes arts and crafts, board games and more. The Nutmeg Pod features a Nintendo Wii, a movie viewing area, the Nutmeg library and Sleepy Hollow, a place for resting and recharging between activities. A colourful mural created by local Grenadian artist Nadine Baksh tells the story of an Enchanted Spice Forest with local indigenous characters such as Manny the Manicou and the Nutmeg Princess. When it is time to reluctantly depart, as a last rite, children are encouraged to dip their hand in a colorful paint and leave their handprint on the wall with their name and age. When they return on their next family vacation, they are eager to revisit the place they literally left their mark. Guests staying at the resort from now through Dec. 15, 2013 can enjoy all-inclusive nightly rates as low as $946 per room, based on two people sharing an Oleander Garden Suite. For the ultimate in casual elegance, vacationers can choose one of Spice Island Beach Resort’s signature Sea Grape Suites (pictured right) which open up directly onto magnificent Grand Anse Beach just steps away from the sparkling Caribbean Sea from $1,146 per room, double occupancy. All suites are air-conditioned and outfitted with spectacular five-star amenities including a large whirlpool, LCD flat panel televisions with cable, dvd player and iPod docking station, the softest and smoothest Italian Frette bathrobes and linens, Molton Brown bath and body amenities, mini-bar, CD player/clock radio, iron, ironing board, hairdryer, direct dial telephone with Internet access, safe, coffee/tea facility, toaster, chaise lounges and patio or balcony. Several suites feature a private pool. The award-winning Spice Island Beach Resort features 64 elegantly-appointed suites, the full-service Janissa’s Spa, a Cybex® fitness center, Oliver’s beachside gourmet restaurant, the Sea & Surf Terrace for light lunches, the Sea & Surf Bar for refreshing cocktails throughout the day, a central swimming pool with swim-up whirlpool, an Omnicourt® tennis court, the Nutmeg Pod children’s activity center, the Gatsby Boutique and more. Spice Island Beach Resort is a proud member of the esteemed Small Luxury Hotels of the World (SLH) collection and the first and only resort in Grenada to be featured in the exclusive Virtuoso network’s Hotels & Resorts Program and Signature Hotels & Resorts Collection. To book directly, contact Spice Island Beach Resort toll-free at 1-800-501-8603, tel: 473-444-4258, fax: 473-444-4807, e-mail: reservations@spicebeachresort.com, or visit www.SpiceIslandBeachResort.com.